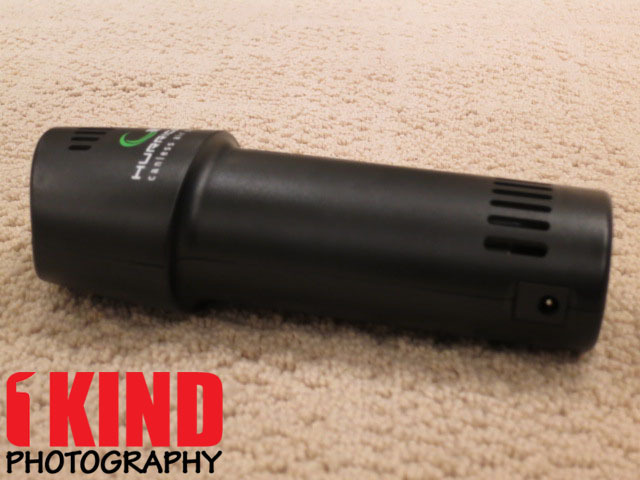 Overview : The Canless Air System O2 Hurricane Industrial Unit is one of the most powerful cordless electronic air duster on the market. It features all of the benefits of Canless standard model, but it contains a larger battery which results in air speeds of over 200 mph. Each charge is equal to 25 cans of air and over the life of the product you will get the equivalent of 10,000 cans of air. The O2 Hurricane Industrial is perfect for companies and professionals who use canned air on a daily basis for heavy duty cleaning. This model can replace canned air in close to 100% of situations. Produces an incredible blast of air at over 200 MPH and runs for over 12 minutes straight (Industrial Unit); 160 MPH and runs for over 15 minutes straight (Original O2 Hurricane). Can be charged over 500 times, equaling over 1,000 cans of air. Designed for corporate and IT department use. Ideal for light to extremely heavy cleaning applications. Great for cleaning large computers, server rooms, camera lenses and mirrors, high end medical equipment, displays in retails stores, IT departments, complex circuit boards, and so much more. 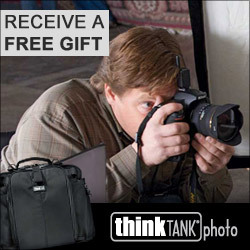 Quality/Usability : As I was browsing one of my usual photography sites, one of the members posted about a rechargeable canless air system called the O2 Hurricane. It is similar to the disposable cans we see on store shelves for cleaning keyboards but rechargeable and canless. When I was a little kid, I use to take a canned air can and spray air in to my mouth, into my face or a siblings and sometimes even turn it upside down to freeze insects or for the frost to evaporate. Who hasn't done any of these when they were little? But reading through the manufacturer's website, it talks about the hazards and dangers of these disposable canned airs. Isn't it just air? It's actually not. It's a mix of various gases (read the back of the can for what it contains). If canned air is used in a poorly ventilated area there is a possible danger of oxygen deficiency and even asphyxiation for anyone in the room. When canned air is held at an angle the liquefied gas can be released onto surfaces or into the air, creating a highly flammable environment in which open flames, and any kind of spark and even electrical switches can cause a flash fire. The liquid propellant in canned air is known to cause frostbite when skin is exposed for a long period of time, causing serious physical injuries. Apart from injury by intentional misuse or accidental exposure, these chemicals pose a large threat to the environment. GHG chemicals emit harmful gases into the atmosphere, while the one-time-use containers end up in landfills. But enough of the warnings of what canned air can cause. Let's see what this canless air can do. The O2 Hurricane is almost 8 inches tall and weighs just 14 ounces. Included are two 5" straws and a wall charger. Simple enough. The straw is not mandatory and only needed for areas you can not reach but not in the really tight areas such as in between the keys of a keyboard, it won't fit into. But the force of the air being blown out will make up for it. It also gives that canned air look. The O2 Hurricane is designed to work best without the use of the straw. 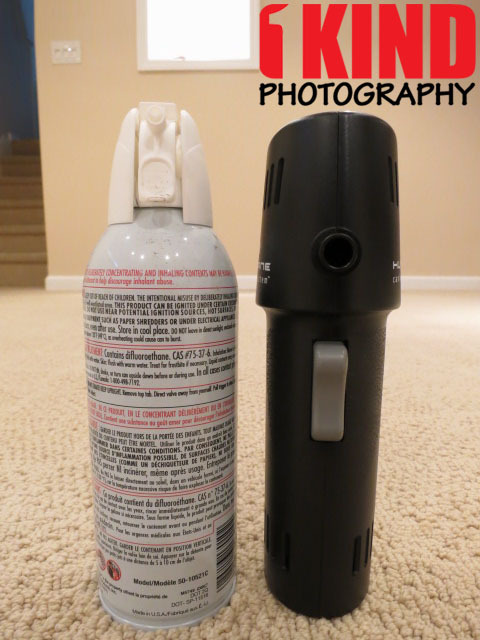 Above are some size comparisons to a canned air duster. 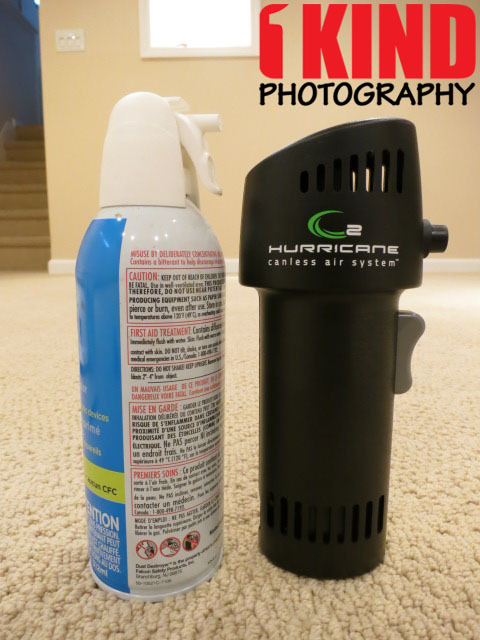 At first glance, the O2 Hurricane looks like an oversized pepper spray but the size is almost identical in terms of height to a canned air duster. The bottom is thinner and the top is bigger than conventional duster cans. It also weighs more. There are two models available. The O2 Hurricane being reviewed (industrial unit) has a gray trigger and the Original O2 Hurricane (standard unit) has a black trigger. O2 Hurricane is completely rechargeable thanks to the NiMH rechargeable batteries that are used. With all my electronics, I tend to use the item until it completely dies and start it's initial charge fresh. Some will have a charge right out of the box but it's all personal preference. To charge the O2 Hurricane, simply plug the wall charger into an outlet and plug the other end into the back of the O2 Hurricane. In a short period of time you have a brand new charge of air. There is a LED indicator on the charger; red means charging and green means charging complete. But there is no battery indicator on the O2 Hurricane to let you know how much battery life is left. Once you pull on the trigger of the O2 Hurricane, rather than hearing the hissing sound and the wind blowing like that of a canned air, you'll hear a loud whining sound of like a hair dryer. This is the coming from the little impeller (fan-like) and impeller housing inside the canless air system. The Canless Air O2 Hurricane can be turned sideways, upside down, or any angle that is needed to power clean hard to reach crevices. Plus, you can use the Canless system in a sustained manner for deep cleaning, and since no chemicals are used there is no chance of frostbite. 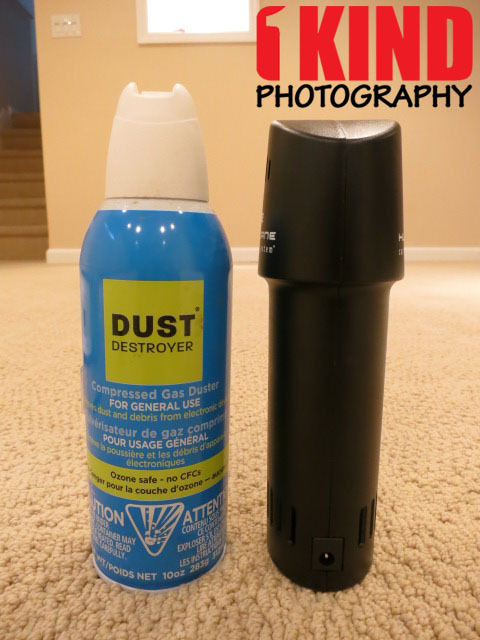 The Canless Air compressed air duster more powerful and better able to reach hard clean to areas than traditional air dusters, computer cleaners and can air solutions. The O2 Hurricane cleans all sensitive electronic equipment including computers, printers, shelves, mini-blinds, fax machines, silk plants, AV equipment, cameras, antiques, automobiles and lots more. So where does the O2 Hurricane get air from if its canless? It uses the air that we breathe. It brings it in from the room, circulates and blows it out from the tip. I tested this on my computer tower that likes to attract dust inside, keyboard and most importantly camera body and lens. Computer - I was able to move around freely without the fear of accidentally freezing any of the internal components. With traditional canned airs, I can only do it for 1-2 minutes before the can lost pressure and got cold. With the O2 Hurricane, I can hold use it for a steady 5 mins without losing pressure. Keyboard - It removed dust that accumulated inside as well as crumbs from food that had fallen in between the keys. I had Pringle crumbs inside the keyboard and didn't know it was there until the O2 Hurricane blew it out. Camera Body - Although my camera is clean, it doesn't hurt to give it a nice burst of air. You would never want to use your breath as you might spit into your camera and the O2 Hurricane is definitely much more powerful than the Giotto's Rocket Air Blower. Due to the high wind that the O2 Hurricane produces, I didn't have it too close and often gave little "spritzes". Lens - There's always going to be dust on the front and rear elements from the constant exposure to the environment or from swapping lenses. It has no problems removing dust or small particles but remember, it's not going to blow off fingerprints or smudges. That's what the LensPen is for. Compared to a canned air, the canned air had more pressure the first 5-6 seconds. But after that, the pressure started to diminish and the can started to get cold. I had to wait about 10 minutes for the can to get warm again before I can use it again. With the O2 Hurricane, I can hold the trigger for 3 minutes and still maintain the same blowing strength. So which one is right for you according to the manufacturer? 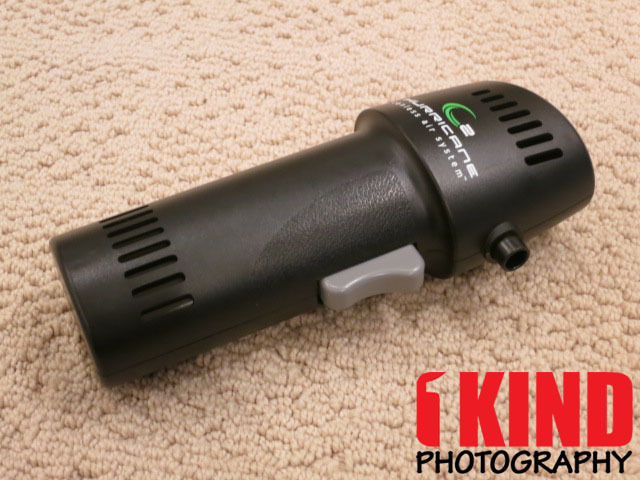 The Original O2 Hurricane (black trigger) is great for people who only use canned air occasionally. It is ideal for computers, keyboards, car dashboards, plants, vents, Venetian blinds, blowing off small patio areas, starting wood fires, cleaning furnace filters, dusting off knick-knacks, blowing off book shelves, cleaning workshops tools and so much more! The Industrial O2 Hurricane (gray trigger) is designed for corporate and IT department use. It is ideal for light to extremely heavy cleaning applications. It is also great for cleaning large computers, server rooms, camera lenses and mirrors, high end medical equipment, displays in retail stores, IT departments, complex circuit boards and so much more! While the Original is geared towards light usage, you never know when you'll need the extra "umph". So if you have the extra money to spend, I suggest getting the Industrial unit since it does the same as the Original with a little more power. 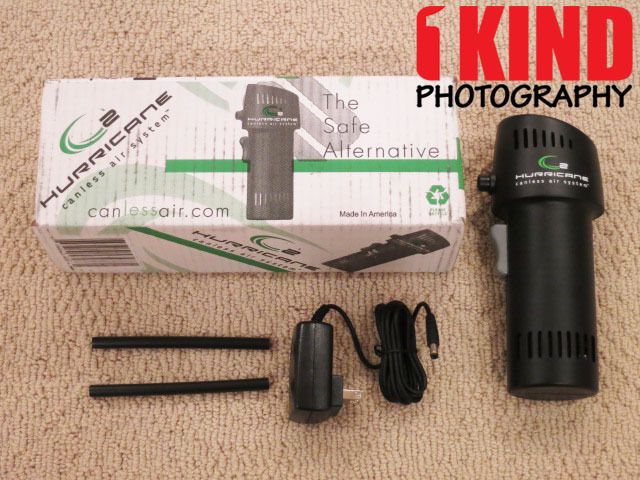 Conclusion : Overall, the O2 Hurricane Canless Air System - Industrial is a innovative product that replaces the conventional canned air that you find on store shelves. It's definitely eco-friendly. The price is definitely high but for the amount you would spend on canned air, this would pay for itself. The O2 Hurricane is a bit loud and it would be nice if it was a little quieter. Granted that the O2 Hurricane is rechargeable and can be recharged over 500 times, it would be nice if there was a cheaper alternative where we can place our own batteries whether it be regular alkaline or rechargeable NiMH batteries like Sanyo Eneloops. 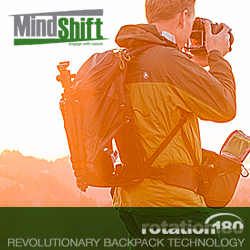 Or even come up with a removable battery pack where users can remove the dead battery pack and pop in a fresh pack. You never know when you might need it and you find out that the battery is dead and you're not near a wall outlet to charge or have the time to wait around for it to charge. This is definitely crucial for techs who are out on the field. It would also be nice if the O2 Hurricane had a battery indicator to let the user know how much battery juice is left. At least the user can gauge whether or not they need to charge it before going out on the field. With the Original, based on the information on the web, it may take you 2-3 passes before you are satisfied while the Industrial can take 1 pass (unfortunately, I don't have the Original to compare the strength).